Dominique Ansel is known all for the invention of the Cronut®, a delicious doughnut and croissant hybrid. Dominique Ansel Bakery Japan rose to fame itself when they introduced the What-A-Watermelon soft serve. Let's see what else they are offering! The French chef Dominique Ansel is known to many people for the invention of the Cronut®, a filled doughnut-croissant hybrid, in 2013. 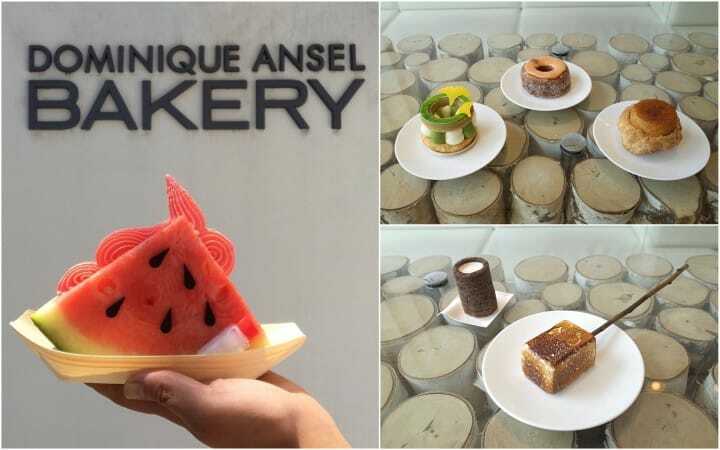 Even though the viral dessert is undoubtedly unique and delicious, it is not the only reason to visit Dominique Ansel's Bakery. In this article, we will introduce you to the Dominique Ansel Bakery in Omotesando, Tokyo as well as six delicious reasons to go there. Dominique Ansel opened it's first and only shop in Japan in Tokyo's popular high-end district Omotesando, in 2015. It is located on a quiet side street and might be a little bit hard to find when you search for it for the first time. The shop itself is warm and inviting and consists of two floors. The first floor contains the bakery and a couple of seats, while the second floor is home to the restaurant. Once you enter the shop you will be greeted by an array of colorful sweet treats. Most of them look like pieces of art and are almost too beautiful to eat. On the other side of the restaurant, you will find an imaginary subway map leading you through Paris, Tokyo, and New York. The stations are named after famous chefs and delicious pastry. Although Dominique Ansel's original shop is located in New York, the shop in Tokyo is more of a sibling, not a twin. It offers its own unique menu with Japanese twists on classics like the Cronut® as well as completely new inventions such as their unique seasonal soft served ice creams. Dominique Ansel wouldn't be the same without the Cronut®. It is a truly scrumptious crunchy yet fluffy pastry filled with rich seasonal ganaches and jams and topped with thick icing. When all the flavors and textures fill your mouth with the first bite, you will probably know why it is so popular all over the world. That being said, the Cronut® flavors differ in Japan. Every month different seasonal flavor popular in Japan are combined in the Cronut® of the month. Japanese classics such as black sesame, shiso, and hojicha (roasted green tea) have all been featured in their own Japanese Cronut® in the past. The DKA (Dominique’s Kouign Amann) has been around since the opening of the original shop. It is a simple yet delicious classic at Dominique Ansel. It is buttery and flaky tender on the inside and crunchy on the outside. It has a slight sweetness to it but the addition of sea salt adds an interesting flavor to every bite. Neither salty nor sweet, it provides the perfectly balanced pastry for everyone. It might look rather simple against all the colorful creations but its simplicity with a unique twist makes it outstanding in its own right. Cookies and milk are a classic combination all over the world. Dominique Ansel has taken a new approach to it by shaping the cookie like a shot glass. This shot glass is filled with warm vanilla-infused milk right before serving. After you take the milk "shot" you can enjoy the soft chocolate chip cookie. If you drink it slowly, the milk will get infused with the chocolate from the glass and you can enjoy chocolate vanilla milk. S'mores are not very common in Japan, Dominique Ansel is one of the only places where you can get a variation of the popular snack in Tokyo. For the Frozen S'more™, handmade vanilla ice cream is rolled in chocolate feuilletine (crispy pieces of sugar cone) and covered in a honey marshmallow. Once your order is placed, a portable burner is used to torch the marshmallow to a perfect golden brown. Make sure to eat right away as the ice cream inside will melt fast due to the warm marshmallow. The Paris Tokyo is created with the traditional Paris Brest pastry in mind. Paris Brest is a French dessert created in 1910 in order to celebrate a big race between Paris and Brest. Dominique Ansel's Paris Tokyo has a matcha and vanilla ganache filling with passionfruit jam in a fluffy pastry ring. The top is glazed with matcha fondant and decorated with white chocolate gingko leaves. Even though it is filled with ganache and jam, it is not too heavy. the matcha taste is subtle and the passion fruit gives it a tart edge. The Paris Tokyo can only be purchased at Dominique Ansel Bakery Japan. The New York store has a Paris New York version filled with chocolate, caramel, and peanut butter. Two years ago, Dominique Ansel Bakery Japan's What-A-Watermelon soft serve became Instagram famous. It consisted of a slice of juicy watermelon, filled with flavorful watermelon soft serve and was decorated with chocolate seeds. It was served with a side of sea salt to sprinkle on the watermelon which helped to bring out the flavors. The What-A-Watermelon soft serve was so popular that it spread to the original New York store and the London store, while it also had a comeback in the Tokyo store this summer. For Autumn 2018 they serve a Chestnut Soft Serve. A Japanese basket filled with whiskey syrup soaked chestnuts topped with richly flavored chestnut ice cream. It is also decorated with chocolate spikes to resemble the outside of a chestnut. The alcohol is just enough for adding a unique flavor but it still wouldn't be suitable for children or people who do not consume alcohol. The combination of the creamy soft serve and the slightly sharp whiskey flavor is rather unique. In Japan, bitter or sharp flavors in sweets are often described as an "adult flavor" and the Chestnut Soft Serve captures the essence of this. The Chestnut Soft Serve will be available until November 30th, 2018 but it might make a comeback just like the What-A-Watermelon soft serve. We just introduced you to some of the items on Dominique Ansel's menu. They also have their own version of the melon pan as well as every changing Japan limited pastries. If you don't want something sweet they also have a couple of savory items as well as a cafe and restaurant on the second floor serving light meals at the weekends. Dominique Ansel believes in reinventing themselves constantly, so no visit will be the same. No matter if you just want to pick up a famous Cronut® or sit down for lunch with a frozen s'more or a soft serve for dessert, Dominique Ansel Bakery Japan is always worth a visit! The shop suddenly closed in 2019. There are no other locations in Japan at the moment. Sweets Paradise - Go To Cake Heaven And Eat As Much As You Want! Stores in Harajyuku/Omotesando area for girls that love fashion!